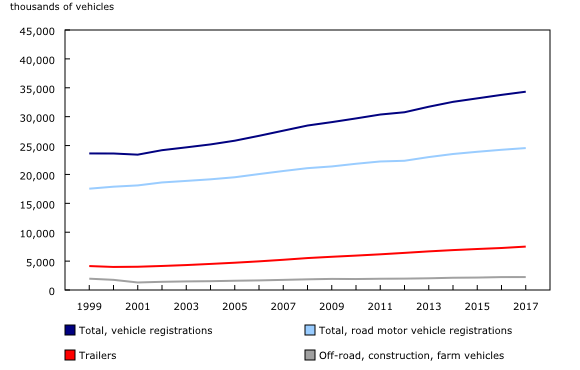 Total vehicle registrations — N.L. Total vehicle registrations — P.E.I. Total vehicle registrations — N.S. Total vehicle registrations — N.B. Total vehicle registrations — Que. Total vehicle registrations — Ont. Total vehicle registrations — Man. Total vehicle registrations — Sask. Total vehicle registrations — Alta. Total vehicle registrations — B.C. Total vehicle registrations — Y.T. Total vehicle registrations — N.W.T. Total vehicle registrations — Nvt. The number of vehicles registered in Canada increased by 1.6% from 2016 to 34.3 million in 2017. Ontario and Quebec accounted for more than half (60%) of the vehicle registrations in Canada. Overall, road motor vehicles accounted for close to three quarters (72%) of the total registered vehicles in Canada, with 24.6 million registrations. Specifically, light-motor vehicles (less than 4,500 kilograms) increased by 1.2% to 22.7 million, representing 92% of all road motor vehicles registered in 2017. Provincially, Ontario had the highest number of road motor vehicles registered at 8.7 million, followed by Quebec. Trailer registrations increased by 3.4% from 2016 to 7.5 million in 2017. Ontario accounted for more than one-third (37%) of trailer registrations, followed by Quebec (28%) and Alberta (19%). There were 2.2 million off-road, construction and farm vehicles registered in Canada in 2017. This annual release presents a count of registered vehicles based on administrative files provided by each province and territory. Registered vehicles include road motor vehicles, such as light road motor vehicles, medium-duty and heavy-duty trucks; buses; motorcycles; other vehicles, such as trailers; and off-road, construction and farm vehicles. Data from this release are used by Finance Canada in the calculation of fiscal equalization payments pursuant to the 1987 Federal–Provincial Fiscal Arrangements Act. This information is also used by various levels of government for the planning and development of transportation infrastructure. Data aggregations are available for Canada and by province and territory.